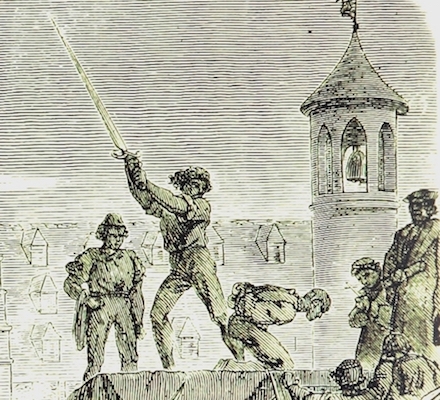 A spy named Fontauban was hanged at the northern city of Lille on this date in 1749. 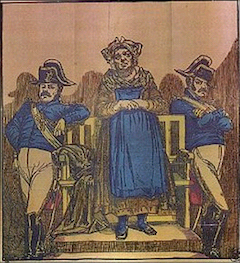 From the scanty information to be had he appears among the more pathetic traitors. Disinherited by his father he had gone into his peculiar trade to great effect during the continent-spanning War of Austrian Succession. Demobilization was a tough transition for spooks as for everyday soldiers; needing to maintain his income, he made an fatally unsuccessful attempt to engage service with the British — and not for any mere document-copying, but for betraying the king himself. 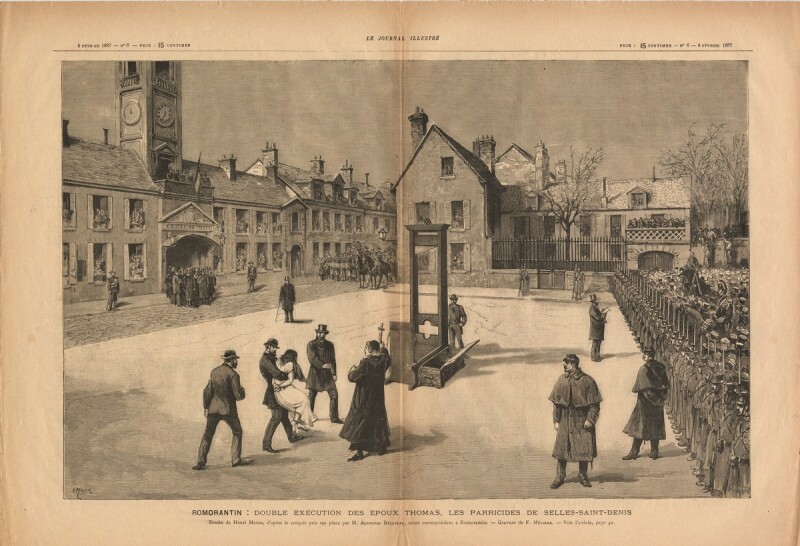 Despite having been open to outright regicide in exchange for a few grotes, Fontauban’s sentence was commuted to hanging (from the proposed burning and quartering) as a gesture of mercy. On this date in 1525, a French marshal’s was executed during a crucial battle of the France-vs-Habsburg Italian War, beginning a long posthuous journey to a wordplay gag. 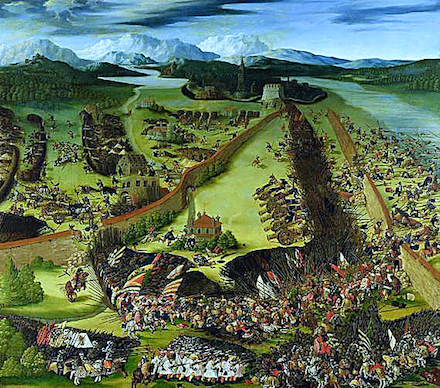 The Battle of Pavia, by Ruprecht Heller (1529). For all that, Francis kept his head and eventually resumed his station. Jacques de La Palice (English Wikipedia entry | the much longer French) did not exit the Battle of Pavia nearly so well. The lord of La Palice (or Lapalisse), grandson to a comrade of Joan of Arc, our man had spent a lifetime bearing French arms; he’d been personally knighted by King Charles VIII for his prowess at age 15 in his very first engagement. 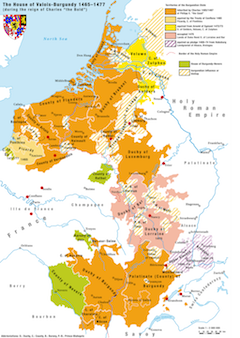 The great bulk of his time ever since had been spent on various campaigns in Italy, where France remained more or less continuously at war against the Holy Roman Empire until 1559. Fighting up and down the peninsula, La Palice earned the impressive rank of Grand Master of France, and it had nothing to do with his chess acumen. He’d actually retired to the pleasures of domesticity after being captured in 1513 at the Battle of the Spurs — so named for the panicked spurring a fleeing French cavalry gave to their horses — only to be recalled to his post in 1515. Late in 1524 he was among the host accompanying King Francis’s march to recover France’s on-again, off-again transalpine beachhead of Milan. This objective the French achieved with scant resistance, but the expedition turned disastrous in a further advance to Pavia. There, 9,000 imperial troops were dug in to defend; unable to take the city by storm the French put it to siege, fatally overextending themselves. Come the following February, the Habsburgs had cut Pavia off from Milan and the French encampment was weakened by defecting mercenaries. On the morning of February 24, the imperial forces mounted an attack on the French that turned into a comprehensive slaughter. 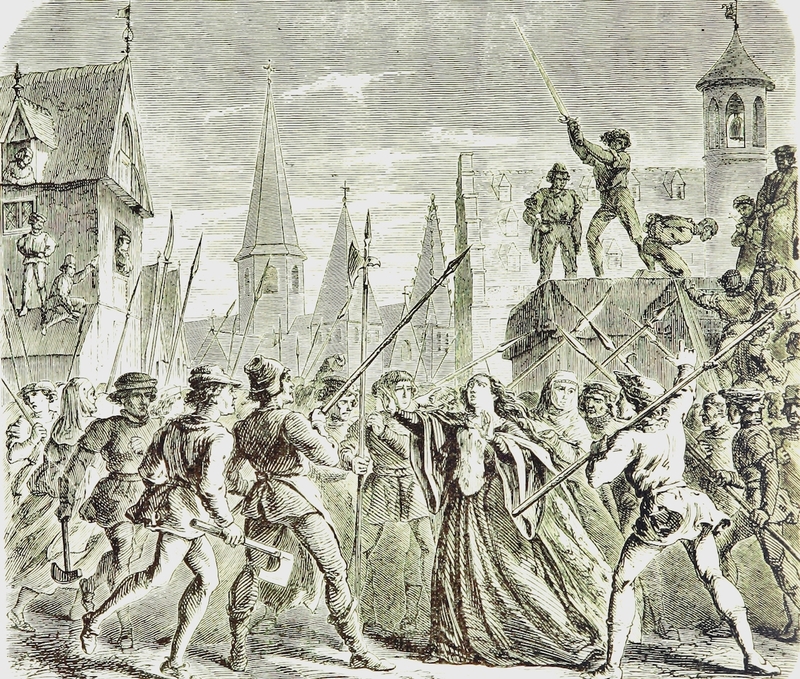 La Palice was captured early on by the Habsburgs’ landsknecht mercenaries and executed by them at some point later on during the fight. 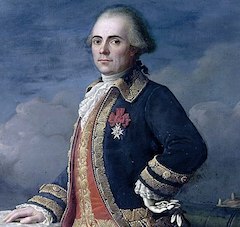 Although his fate was a bit more premeditated, he was only one of many blue-blooded commanders who lost their lives on the field that dark day for France† — suspending French ambitions in Italy, if only for a few years. The knight’s alleged feats are celebrated in a ballad known as “La chanson de la Palisse” (“The Song of La Palice”). Rather, there are dozens of versions of that ditty, dating from the 16th to the 18th century, of unknown original authorship but agglomerated by the French poet Bernard de la Monnoye into a humorous caper in the 18th century. He would still be envied. It’s thanks to this amusing misreading that the French tongue today enjoys the term lapalissade, meaning a laughably obvious truism — and in Monnoye’s composition the entirety of the lyrics consist of such jests; e.g. wounded with a cruel hand. that the wound was mortal. was the last day of his life. he would have lived more. * Ample unverifiable folklore attaches an event so memorable as the capture of a king; a site such as this is bound to note the one that reports that Francis might have been killed on the spot by rampaging foes but for the timely intercession of a young Spanish soldier named Pedro de Valdivia … who would go on to become the conquistador of Chile, and eventually an execution victim himself. 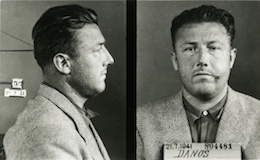 ** Francis renounced the treaty as soon as he was released, on the accurate grounds that it was made under duress. 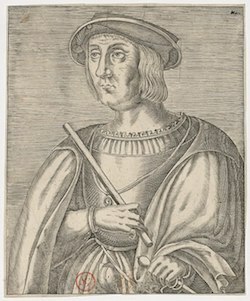 In this betrayal of honor, he did his kingdom much the better turn than his distant predecessor John II had done when, captured by the English during the Hundred Years’ War, he dutifully set about extracting from his subjects the ruinous ransom and even returned voluntarily to English custody when he could not fulfill the terms of his parole. † Another corpse at the Battle of Pavia was Richard de la Pole, Plantagenet pretender to the English throne ever since his brother had been executed back in 1513. Vietnamese mystic Phan Xich Long was executed on this date in 1916 by the French, after attempting to expel their occupation and situate himself as Emperor of Vietnam. In his youth a peripatetic fortune-teller and geomancer, Phan Phát Sanh (as he was then known) formed a secret society by 1911 centered around enforcing his rights as the purported long-lost descendant of Ham Nghi — an 1880s emperor whose short reign ended in French captivity. By 1912 he was barnstorming the Mekong Delta in saffron robes, buttressing his pretense to the throne with all the aspirations and disappointments of an occupied people. It was now that he took the name by which history recalls him, meaning “Red Dragon”, orchestrated a coronation ceremony, and set himself at the head of a movement equal parts messianic and patriotic, gradually cementing the credibility of his royal bona fides through various rumors and forgeries. The would-be emperor and his adherents made no bones at all about their rebellious intent; Long wielded a ceremonial sword inscribed with the words “First strike the debauched king, next the traitorous officials”. Debauched kings and traitorous officials had other plans as they usually do, and the French managed to arrest the Red Dragon on the eve of his planned rising on March 1913. It went off anyway; few followers yet realized that their emperor was in manacles, though they soon realized that the invisibility potions that the mystic had prepared for them were nothing of the sort. The rebellion was crushed within days. They hadn’t seen the last of him: years later another rabble-rouser would claim to be Phan Xich Long’s reincarnation. Today, there’s a street named for Phan Xich Long in Saigon. 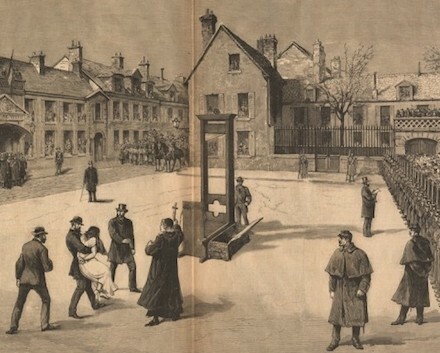 * These appear to me to have been executed by musketry (military court, mind) rather than guillotine but few sources I’ve seen are prepared to take an explicit stand on this detail.